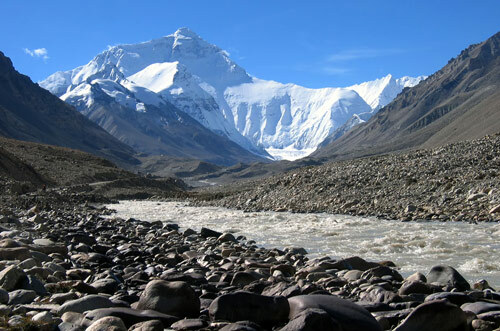 What to Expect This fast-paced, escorted tour includes a reasonable amount of walking or hiking, and reaches high altitudes requiring that you be in good physical condition to fully enjoy the trip. This tour also includes long scenic drives between destinations and may have limited rest stops. India, one of the world's hottest destinations for savvy travelers, entices all the senses with exotic sights, sounds, colors and fragrances. Temples, tradition and colorful festivals dominate the landscape. This special tour transports you to the famed Pushkar Camel Fair, a spectacle attracting thousands of people and lavishly bedecked camels. Explore the "Golden Triangle" of India—from fascinating and exotic Delhi, to Agra and the Taj Mahal, the world's most famous and lovely monument, to Jaipur, the "pink city," full of lavish mansions and palaces. 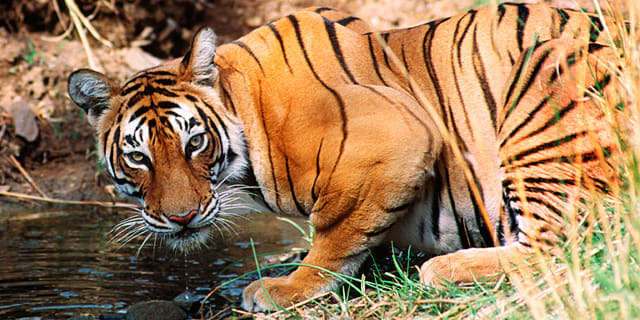 At this price, you can't afford to miss the chance to see India for yourself! Arrive in Delhi, India's capital. Following customs and immigration formalities, meet our representative and transfer to your hotel. Accommodations: 2 nights AWX Luxury Camp or similar. Pushkar. Included meals: Breakfast, lunch & dinner. Full Day Itinerary: Early this morning, transfer to the New Delhi Railway station to board the Shatabi train to Ajmer in Rajasthan. From there, a motor coach will take you to the luxury campsite in Pushkar, arriving in time for a welcome reception. 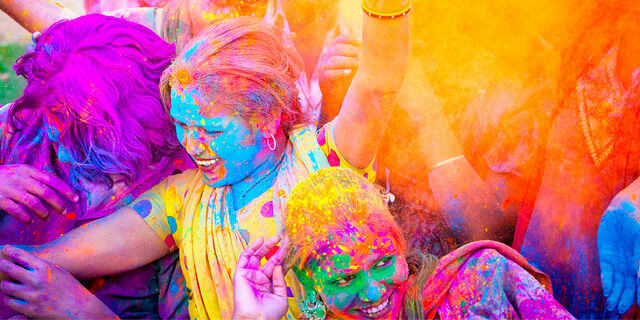 Each November during the Kartik Purmina full moon, The Pushkar Fair is a spectacle of color, tradition and theater. Spend two days experiencing this extraordinary carnival of camel trading and religious tradition. Marvel at lavishly bedecked camels and myriad bazaars selling everything from saddles to silver to adorn both humans and camels. In the afternoon, enjoy a tour of the bustling town of Pushkar, a small, provincial town that swells to 200,000 people during the Pushkar Fair. Uniquely located on the edge of a desert but surrounded on three sides by verdant forest. 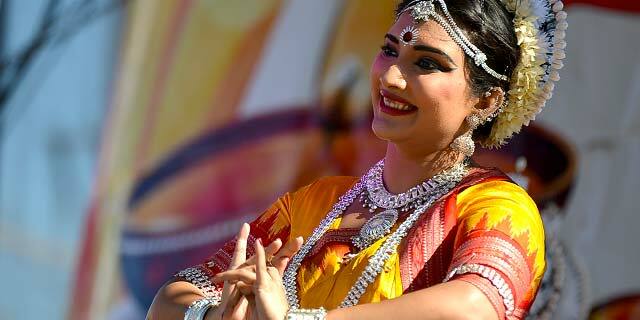 Return to the camp, and have an afternoon at leisure to enjoy the Pushkar celebrations. All meals are provided at the camp, and all food served is strictly vegetarian. 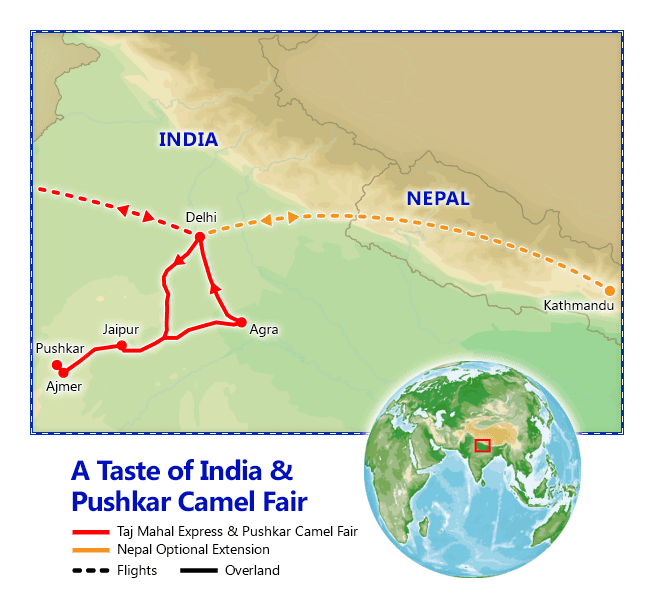 *Note celebrations in Pushkar during the Camel Fair can occur throughout the night. Light sleepers may want to consider bringing a pair of earplugs. Full Day Itinerary: After a traditional breakfast, visit the famous Brahma Temple, the only one in the world dedicated to Lord Brahma, creator of the universe and all beings, according to Hindu teaching. Climb the marble steps up the high platform and enter the marvelously ornate interior of carved marble, silver doors, and colorful peacocks, the vehicle of Lord Brahma’s consort Saraswati. Visit to the holy Pushkar Lake, surrounded by more than 500 Hindu temples and 52 bathing ghats, where pilgrims throng. Hindu tradition holds that a dip in this lake, on Kartika Purnima, the New Moon Festival when the Pushkar Fair is typically held, cleanses the bather of sins and can even cure illness. After lunch at the camp, visit the colorful and bustling bazaar. Numerous makeshift stalls sell adornment for both cattle and humans, from saddles to silver beads and ornate garments. After dinner, enjoy the Pushkar festivities. Accommodations: 2 nights ITC Rajputana or similar, Jaipur, Included meals: Breakfast. Full Day Itinerary: After breakfast, we’ll travel through the most colorful region of India, Rajasthan, a land endowed with invincible forts, magnificent palaces, waves of sand dunes and serene lakes. Arrive in the “pink city” of Jaipur and check into your hotel. Jaipur is India's first and perhaps best-planned city, full of beauty and color, serene lakes and wide tree-lined streets. Surrounded by rugged hills topped with forts, magnificent palaces and gardens dot the countryside, all witness to royal processions and splendor in days gone by. Except for the busy traffic of bicycles, cars and buses, little seems to have changed since 1727, when Maharaja Sawai Jai Singh II designed and built the city. The balance of the day is at your leisure to rest or explore. We recommend a stroll through the streets and bazaars, taking in the aromas of spices and displays of women's dresses and men’s turbans. Buy spices or barter for one of the beautiful, hand-woven wool carpets for which Jaipur is known. Jaipur is famous for silver jewelry, semi-precious stones, bangles and handicrafts. Ladies can have their hands painted with henna from roadside mehndiwala (henna painters). En-route to the Amber Fort, stop briefly to see the Hawa Mahal, the "Palace of Winds"
Full Day Itinerary: After breakfast, the morning's tour takes you to the imposing Amber Fort, ancient capital of Rajasthan. Begun in the 17th century by Maharaja Mansingh, Emperor Akbar's most successful general, the fort is perched atop the Aravalli hills overlooking the Moat Lake. The fort's fortified battlements and crenellated walls spread over many acres. Ascend to the fortress by jeep to view the sprawling complex of courtyards and halls, many of them hung with magnificent paintings and inlaid with precious stones. In the Sheesh Mahal—Hall of Mirrors—a single lamp reflects in a mosaic of thousands of mirror tiles, lighting the entire room. En-route to the Amber Fort, take a brief photo stop and see the Hawa Mahal, the "Palace of Winds." Its beehive-like structure is an interplay of red and pink sand stone, painstakingly outlined with white borders and motifs. Behind this elaborate latticed facade, the cloistered ladies of the court could watch the daily goings-on in the street below. In the afternoon, tour the city of Jaipur, including the City Palace, an overwhelming complex of exquisite palaces, gardens, courtyards, decorative art and carved doorways, View the rare manuscripts, armory, and miniature paintings at the palace museum. Walk to the adjacent Jantar Mantar, the largest of five observatories founded by classical astronomer Sawai Jai Singh II nearly three centuries ago. Fourteen massive and extraordinarily precise masonry instruments were used for measuring time, predicting eclipses, tracking stars' location, and ascertaining the declinations of planets. *Kindly note that you will see elephant rides offered around the Amber Fort. However, Friendly Planet Travel has made the compassionate decision to not include elephant rides in our itineraries, as they process to train these brilliant animals is not up to our ethical standards as it is painful and involves "breaking" so they don't pose a risk of attacking humans. In addition, elephant backbones are delicate and not meant to carry the weight of saddles and people. Should you have any questions, please feel free to contact us. Accommodations: 2 nights ITC Mughal or similar, Agra or similar. Included meals: Breakfast & lunch. Full Day Itinerary: After breakfast, depart for Abhaneri Village, a popular stop along the Agra-Jaipur road for the impressive Chand Baori stepwell and the Harshat Mata Temple. The Chand Baori is perhaps the region’s most visited stepwell and is one of the largest and deepest in all of India. These stepwells were created to harvest rain water and also provided the locals a place to cool off during the hottest summer months as the temperature is a few degrees cooler at the bottom of the well than at its surface. After some exploration, continue to a local restaurant for an included lunch. Afterwards, learn the art of tying colorful turbans and odhanis/chunnis, and receive insights regarding their importance. 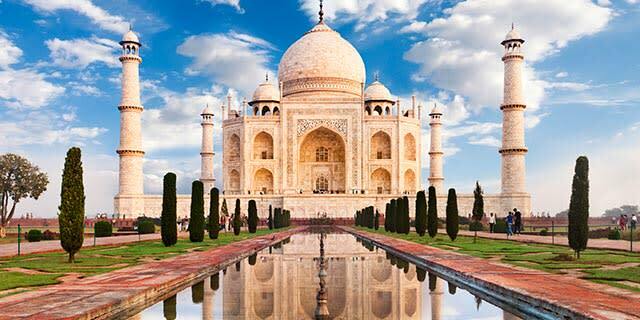 We’ll continue to ancient Agra, once the capital of a sprawling Mughal kingdom covering much of Southeast Asia. Check-in at your hotel and enjoy the remainder of the day at leisure. Full Day Itinerary: Rise early for a breathtaking morning tour of the Taj Mahal, one of the true wonders of the world. Built in the 17th century by the Mughal Emperor Shah Jahan as an expression of his love for his wife Mumtaz Mahal, the Taj took 22 years and 20,000 men to build. The white marble was quarried 200 miles away and transported to the site by a fleet of 1,000 elephants. Though the Taj is known for its stunning symmetry and balance, it is the close-up marble inlay work that is truly astounding. You'll have ample time to explore this outstanding piece of architecture, and to wander the pristine gardens that surround it. *Departure from the hotel may be as early as 5:30am. Visit time may change depending on weather conditions. After breakfast, visit the splendid Agra Fort, a UNESCO World Heritage Site, built by and inhabited by six successive generations of Mughal emperors—Babur, Humayun, Akbar, Jehangir, Shah Jahan and Aurangzeb. Though often eclipsed by the Taj Mahal, this sprawling fortress, or more accurately a massive walled palatial city, is magnificent in its own right. It was here that Shah Jahan was imprisoned by his son, Aurangzeb, and from the Muasamman Burj, a tower with a marble balcony, Jahan watched the continuing construction of his Taj Mahal until his death. In the afternoon, you may visit the local marble and leather markets such as the Petra Dura Workshop, world renowned for its marble inlay tradition. This evening, you are a guest for High Tea. This special treat, arranged exclusively for Friendly Planet travelers, provides an opportunity to meet and interact with an Indian family and get an insider’s glimpse into life in India. Passengers taking the optional Nepal extension will overnight in New Delhi at the Novotel New Delhi Aerocity, or similar. Continue on Day 9 of the extension itineraries below. Take advantage of your already included airfare and add an optional extension to mysterious Nepal. The Nepal Extension includes 1 night in Delhi, round trip flights from Delhi to Kathmandu, 3 nights in Kathmandu with a full touring program, transfers, buffet breakfast daily and a farewell dinner and performance. Passengers taking the Nepal Extension will return to the U.S. 4 days later than the return dates shown.